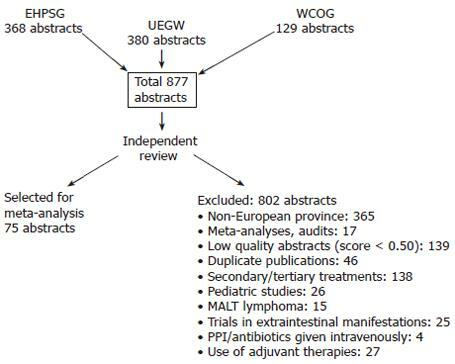 AIM: To meta-analyse the European abstracts presented between 1997-2004 at the European H pylori Study Group, United European Gastroenterology Week meetings and World Congresses of Gastroenterology. METHODS: The abstracts of randomized/controlled prospective studies were classified into groups based on first-line eradication schedules. The quality of the abstracts was checked by a validated score system. The pooled eradication rates (PER) and combined odds ratios (OR) were calculated and compared with the published meta-analyses. RESULTS: The PER of proton pump inhibitor-based (PPI) one week triple therapies was 81.4% (confidence interval, 95% CI: 78.5-84.5). Ranitidine bismuth citrate-based (RBC) triple regimens have an efficiency rate of 78.5% (95% CI: 70.5%-84.3%) (P = 0.28 vs PPI). The OR for PPI effect vs RBC regimens was 1.1 (95% CI: 0.92-1.30). H2 receptor antagonist-based triple therapies achieved 64.1% (95% CI: 52.6-75.6) (P = 0.02 < 0.05 vs PPI), the OR vs PPI regimens was 1.55 (95% CI: 0.72-3.78). PPI-based double combinations were less efficient than triple regimens (PER: 55.0%, OR: 4.90, 95% CI: 2.36-9.70). Quadruple regimens were successful in 82.6% (95% CI: 76.0-89.7), the OR vs triple therapies was 0.80 (0.62-1.03). Clarithromycin + amoxicillin or nitroimidazole combinations were efficient in 80.5% (95% CI: 77.2-84.2) and 83.8% (95% CI: 81.7-85.9), respectively. Amoxicillin + nitromidazole therapies eradicated the infection in 73.5% (66.6-78.5) (P = 0.01 < 0.05 vs clarithromycin-based regimens). CONCLUSION: PPI/RBC-based triple therapies achieved comparable results with the meta-analyses. H2-receptor antagonists and PPI-based double combinations were less efficient. Triple and quadruple regimens were equally effective. Clarithromycin + either amoxicillin or nitroimidazole containing regimens were more effective than amoxicillin + nitroimidazole combinations. High quality congress abstracts constitutes a valuable pool of data which is suitable for meta-analytical workup. Numerous treatment regimens have been tested for their efficacy in curing H pylori infection worldwide[1-3]. Meta-analysis has become a frequently used method for resolving such uncertainties and obtaining sound data in evidence-based medicine. The purpose of a meta-analysis is to statistically combine the results of similar trials and such studies are aimed at improving the estimation of treatment effects and minimizing the potential biases of such estimations. Following the increased rate of randomized controlled trials (RCT) published, the importance of meta-analyses has risen and its methodology has become more and more sophisticated. This is particularly true for H pylori eradication where we see an exponential rise of studies published worldwide. As a part of the evidence-based medicine, most of the meta-analyses only addressed the RCTs. However, it was rapidly realized, that RCTs do not come close to covering the complete range of studies and therefore, the inclusion of studies representing lower levels of evidence or congress abstracts was also accepted in some of the studies[2,3]. Score systems for assessing the quality of meta-analyses, RCTs[4,5] and abstracts have also been worked out. Participation at scientific meetings represents a popular opportunity to disseminate results which, because of linguistic barriers would hardly be published in peer-reviewed journals. The aim of our study was the meta-analysis of the European abstracts dealing with the first-line treatment of the H pylori infection, presented at the European H pylori Study Group (EHPSG), United European Gastroenterology Week (UEGW) and World Congress of Gastroenterology (WCOG) meetings held between 1997-2004. We thus investigated an unexplored area which was only in part covered by meta-analyses published so far. Abstracts presented at the EHPSG, UEGW and WCOG meetings between 1997-2004 were reviewed independently by the authors. These meetings were chosen because acceptance of the papers is decided after a peer-review process similar to submitting to journals. The randomized and prospective controlled open studies dealing with the first-line eradication of H pylori, provided by European authors were included. Accepted abstracts had to include at least 2 treatment arms, to specify the diagnosis of patients, the exact drug doses, the duration of treatment and method of eradication control (histology, culture, rapid urease test or 13C-urea test). Exclusion criteria: studies coming from other continents or multi-center studies with participating centers outside Europe were not considered. Duplicate abstracts were identified and considered only once. Meta-analyses, audits and papers presenting prescribing practices were not included. Trials not specifying the type of PPI/antibiotic used, duration of treatment or incomplete data were excluded. Only eradication trials in peptic ulcer, chronic gastritis and functional dyspepsia were included, conditions in which treatment of the infection are recommended by the 1st and 2nd Maastricht consensus conference[7,8]. Trials performed in the extragastric manifestations of the infection, MALT lymphoma and pediatric population were not part of the study. Studies using PPIs, antibiotics given intravenously or probiotics were also omitted. A flow-chart of the study is presented in Figure 1. The quality of the abstracts was verified by a validated score system including 19 items, in order to compare to the most relevant methodological details. Abstracts having a quality score under 0.50 were not accepted. Figure 1 Flow-chart of the meta-analysis. The treatment arms of the abstracts were classified and groups of similar regimens were constructed as follows: (1) PPI-based one week triple combinations; (2) Ranitidine bismuth citrate (RBC)-based one week triple combinations; (3) H2-receptor antagonist-based triple regimens; (4) Double combinations (PPI/RBC + 1 antimicrobial); (5) Quadruple therapies (PPI + bismuth compound + 2 antimicrobials); (6) Antimicrobial-based analysis: - PPI + clarithromycin + amoxicillin or a nitroimidazole, - PPI + amoxicillin + nitroimidazole, - RBC + clarithromycin + amoxicillin or a nitroimidazole. The results obtained were compared with the available meta-analyses based on the data of RTCs in order to assess whether the results of abstracts overlap with the latest data of the evidence-based medicine. The eradication regimens were pooled into groups shown above. The data were entered in an Excel database which was checked by hand for errors. While the ‘per protocol’ (PP) data were given only in a part of the abstracts, the results on ‘intention-to-treat’ (ITT) basis were taken into consideration. The groups were checked for homogeneity by the chi-square test. The ‘pooled eradication rate’ (PER) of the groups including all treatment arms of similar regimens (i.e. groups 1-6) was calculated using equal effect analysis, assuming that different populations have the same outcome (N-weighted calculation). Differences between the groups were assessed by the chi-square test and the level of P = 0.05 was considered significant. The 95% confidence intervals (CI) were calculated. Within the groups 1-6, from the comparative trials the individual Peto odds ratios (OR) were estimated and the combined ORs were assessed assuming a random effect model. The change over time of the eradication rates of PPI-based therapies was performed by calculating the PERs for each year of the period studied (1997-2004). The statistical formulae were used as described in the literature[9,10]. The statistical work was performed using the ‘Statistica 9.0’ software (Tulsa, Oklahoma, USA). In the post-Maastricht period, between 1997-2004, 877 papers dealing with the therapy of H pylori infection were presented during the selected meetings, from which 75 met the inclusion criteria. The accepted abstracts included 188 study arms and 15 634 patients. Eight hundred and one abstracts were excluded for the reasons shown in the flow-chart. The accepted abstracts had a mean quality score of 0.66 (95% CI: 0.52-0.77). Data on the homogeneity of the groups are given in the text and Tables 1-5. Table 1 Effect of PPI-based 1 wk triple therapies on the eradication of H pylori in European countries (pooled estimation of all treatment arms). 1 Omeprazole vs other PPIs; Test of homogeneity: Omeprazole, χ2 = 6.12, P = 0.08; Lansoprazole, χ2 = 5.56, P = 0.09; Pantoprazole, χ2 = 1.46, P = 0.22; Rabeprazole, χ2 = 3.45, P = 0.33; Esomeprazole, χ2 = 1.96, P = 0.38. Figure 2 Omeprazole vs lansoprazole-based triple therapies: results of the comparative trials (Peto graph of the individual and combined ORs). Figure 3 H2-receptor antagonists and PPI-based triple regimens: results of the comparative trials (Peto graph of the individual and combined ORs). Figure 4 PPI-based double and triple regimens: results of the comparative trials (Peto graph of the individual and combined ORs). Table 5 Results of the direct comparative trials of different antibiotic combinations on the eradication of H pylori in European countries. Test of homogeneity: PPI + C + A vs PPI + C + N, χ2 = 0.01, P = 0.92; PPI + C + A vs PPI + A + N, χ2 = 3.26, P = 0.07; PPI + C + N/PPI + A + N, χ2 = 0.01, P = 0.99; RBC + C + A/RBC + C + N, χ2 = 2.58, P = 0.11. PPI: proton pump inhibitors, A: amoxicillin; C: clarithromycin; N: nitroimidazoles; RBC: ranitidine bismuth citrate. PPI-based one week triple regimens: Most of the authors adhered to the provisions of the Maastricht 1 consensus and administered PPI-based triple regimens as first-line therapy[12-15,17-19,21-30,32-65,78-85]. The PERs of the PPI-based regimens and homogeneity values are given in Table 1. The overall efficacy of the PPI-based one-week triple therapies was 81.4% (95% CI: 78.5-84.5). Therapeutic experience was gained with all 5 commercially available PPI. There was no statistically significant difference of the PERs between the groups. All PPIs obtained eradication rates around 80% on ITT basis. In comparative studies, using omeprazole as the index drug, the combined ORs showed equivalence to the other PPI’s (Table 2). An example is given in Figure 2 representing the results of comparative trials using omeprazole and lansoprazole-based triple regimens. The rates of H pylori eradication by the PPI-based triple therapies from 1997 to 2004 are presented in Table 3. No change over time of the eradication rates was recorded. Table 2 Results of the direct comparative trials of the PPI-based 1-wk triple combinations. Test of homogeneity: Omeprazole/Lansoprazole, χ2 = 2.76, P = 0.1; Omeprazole/Pantoprazole, χ2 = 2.69, P = 0.12; Omeprazole/Rabeprazole, χ2 = 2.45, P = 0.12; Omeprazole/Esomeprazole, χ2 = 0.12, P = 0.72. Table 3 Changes over time of the eradication rates of PPI-based one-triple therapies between 1997-2004. 1P: 1997 vs other years; P = 0.04 < 0.05 2002 vs 1999; no other significant difference in between-year comparisons; Test of homogeneity: 1997, χ2 = 9.98, P = 0.19; 1998, χ2 = 0.71, P = 0.39; 1999, χ2 = 3.0, P = 0.08; 2000, χ2 = 5.17, P = 0.15; 2001, χ2 = 0.15, P = 0.72; 2002, χ2 = 0.2, P = 0.7; 2003, χ2 = 0.14, P = 0.8; 2004, χ2 = 0.14 , P = 0.8. RBC-based triple regimens: They were administered to 2051 patients in 24 studies/27 treatment arms and obtained a PER of 78.5% (95% CI: 70.5-84.3)[11-31]. (Test for homogeneity: χ2: 2.79, P = 0.16). 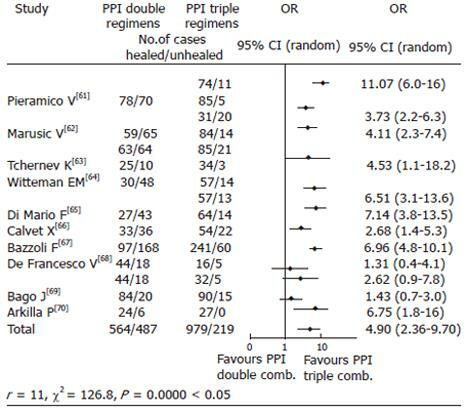 The OR for the effect of PPI’s vs RBC in triple combinations was 1.10 (0.92-1.30). Including all treatment arms, there was no significant difference of the PERs between PPI- and RBC-based triple regimens (P = 0.28). H2-receptor antagonist-based triple regimens: They were given to 374 cases for 7-10-14 d in 4 studies/8 treatment arms,[58-60,75] and obtained 64.1% (52.6-75.6) eradication, which was significantly lower as compared to PPI-based regimens (74.4%, 95% CI: 59.5-84.8) P = 0.028 < 0.05). (Test for homogeneity: χ2: 0.21 P = 0.56.) 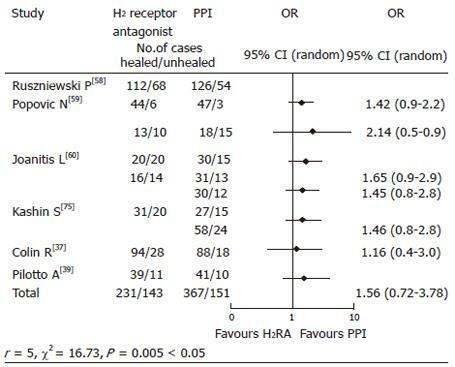 The OR for the effect of PPI vs H2-RA based regimens was 1.55 (0.72-3.78) (Figure 3). However, these groups were heterogeneous (Figure 3). Double combinations: PPI + 1 antimicrobial schedules given for 7-14 d were administered to 1051 cases in 10 studies/14 treatment arms and achieved PER of 55.0% (38.6-71.4)[67-77]. (Test for homogeneity: χ2: 2.47, P = 0.12.) In comparative trials, triple combinations were efficient in 82.48% (75.4-89.3) (P = 0.000 < 0.05), the combined OR favoring triple combinations (4.90, 95% CI: 2.36-9.70) (Figure 4). The groups were heterogeneous (see Figure 4). RBC-based dual therapies lasting 7-14 d were given to 268 cases in 4 studies/4 treatment arms[12,18,77,78] and obtained 77.6% (69.6-85.5) PER, which was not significantly lower than the rates of triple RBC combinations (80.8%, 72.9-88.5) (P = 0.43). (Test for homogeneity: χ2: 0.16 P = 0.60.) In direct comparative trials, the OR for the effect of RBC double vs triple combinations was 0.83 (0.51-1.33). Quadruple therapies: They were administered as first-line regimens to 611 cases in 10 treatment arms, and the PER was 82.6% (76.0-89.2)[76,79-82]. (Test for homogeneity: χ2: 0.13, P = 0.61.) In comparative trials, triple therapy’s PER was 81.2% (76.4-86.0) (P = 0.07). The combined OR for the effect of triple vs quadruple therapies was 0.80 (0.62-1.03) (80-82). Antibiotic combinations: The eradication rates obtained with PPI + clarithromycin or either amoxicillin or nitroimidazole regimens compared with PPI + nitroimidazole + amoxicillin are presented in Table 4 (all treatment arms). Clarithromycin + amoxicillin or a nitroimidazole containing regimens were significantly more efficient than amoxicillin + nitroimidazole combinations (P = 0.01 < 0.05 and P = 0.001 < 0.05, respectively) (Table 4) and the OR favored the former therapies over the latter (Table 5). There was no significant difference in the efficiency rate of RBC + clarithromycin + amoxicillin and RBC + clarithromycin + nitroimidazole regimens (P = 0.90), the combined OR values indicating these combinations were equivalent (OR:1.03, 95% CI: 0.65-1.38). Table 4 The effect of antibiotic combinations on the eradication of H pylori in European countries (pooled estimation of all treatment arms). 5 RBC + C + CA vs RBC + A + N.
In the present study, we assessed the eradication rates of different anti-H pylori-regimens given in European countries in the post-Maastricht period. Several meta-analyses evaluated the efficacy of the eradication regimens[1-3,87-91,93,95,96]. To our knowledge, this is the first meta-analysis based solely on abstracts coming from the European countries, thus exploring a previously unexplored database. Our purpose was to assess whether or not these results are comparable with the results of the latest meta-analyses. According to our data most of the European authors followed the recommendations of the Maastricht 1-2 consensus meetings[7,8]. Thus, the PPI-based triple therapies were the most frequently used regimens. The PER of all treatment branches using these combinations was comparable with the earlier meta-analyses. In the first such review evaluating the pre-Maastricht era studies (1992-1996), a PER of 78.3% (64.6%-88.4%) was obtained. In the largest meta-analyses published thus far, 666 publications summarizing 53 228 patients were reviewed and the PER of different PPI-based combinations was between 80%-85%, which is also compatible with our data. In another study, in 22 RCTs performed before 1999, the PER of PPI + clarithromycin/amoxicillin or metronidazol regimens was 81% (95% CI: 79-83). No differences of the PERs of the available PPI’s were observed in the eradication of H pylori and in direct comparative trials, the OR analysis showed that neither of the PPI’s was favored. 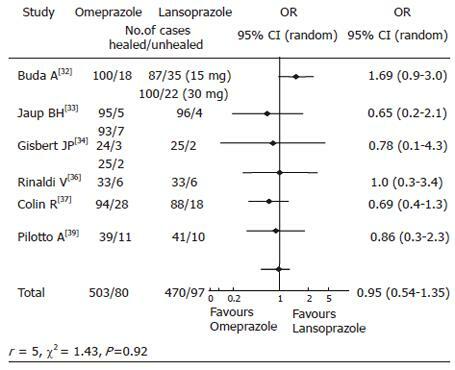 This is compatible with the recent data showing that in comparative trials, the efficacy of omeprazole and pantoprazole[88,89], rabeprazole lansoprazole and esomeprazole was similar. There are data suggesting a decrease in the eradication rate of PPI-based triple regimens in recent years; however, as shown in Table 3, such changes over time could not be confirmed in our analysis. The PER of RBC-based triple regimens is similar with that of PPI’s and in comparative trials, the OR values indicated these therapies were equivalent, which is in accordance with a meta-analysis, and is in agreement with the Maastricht consensus recommendations. According to our data, H2-receptor antagonist-based therapies were inferior to either PPI or RBC-containing regimens and the ORs favored the later schedules. The heterogeneity of the groups, however, needs caution in the interpretation of these results. In a meta-analysis, the overall efficacy of H2 receptor antagonists and PPI’s as adjuvants for H pylori therapy was similar (78% vs 81% on ITT basis); including clarithromycin in the regimens, a non-significant trend favoring H2 receptor antagonists was observed (OR1.14, 95% CI: 0.76-1.71). In another study, the overall efficacy of PPI was superior to H2 receptor antagonists (74% vs 69%, OR: 1.31, 95% CI: 1.09-1.58); however, prescribing high doses of H2 blockers could improve the results. This discrepancy warrants further study while in case of equivalence, the use of H2-receptor blockers would have pharmaco-economic advantages. PPI-based double combinations[61-71] were clearly inferior to triple regimens, which is in accordance with the evidence-based data and they are probably not more recommended in the first-line treatment of the infection. Interestingly, RBC-based double combinations have similar efficacy with the triple regimens[11,16,71,72]. However, no meta-analysis addressed this issue. Here again, heterogeneity of the groups might influence the results. Quadruple therapies have been demonstrated to be very effective and safe either as first or second-line therapies. Concerns have been raised regarding the optimal duration of treatment, efficiency and side effects, because prolonging the therapy is not cost-effective, the gain in effectiveness is modest and the tolerability could be impaired. Overall, quadruple regimens were not better than triple therapies[70,73-76] and this is in agreement with a recent meta-analysis, where these therapies seem to be roughly equivalent (81% vs 78%, OR: 0.81, 95% CI: 0.55-1.20). The Maastricht 2 Consensus recommended their use as a second-line treatment but, and according to a recent meta-analysis, they could equally be used as first-line, based on their efficacy. The choice of antimicrobials is of crucial importance while resistance to antibiotics is a major determinant of the eradication outcome[3,97]. In our study, clarithromycin + amoxicillin or a nitroimidazole combination have a superior yield as compared to amoxicillin + a nitroimidazole combination, which is in accordance with a meta-analysis. We conclude, that selection of high-quality abstracts of major gastroenterologic meetings constitutes a valuable pool of data for meta-analysis. The results obtained by us are mainly in accordance with the existing data. Some discrepancies must be resolved by further studies. Primary treatment for H pylori infection is usually successful in over 80% of the patients; however, there is no ideal first-line regimen[98,99]. Nevertheless, it was not our intention to analyze all aspects of the eradication therapy, which would be far beyond the scope and extent of this work. Other details, i.e. data on the influence of initial diagnosis (i.e. gastric or duodenal ulcer, functional dyspepsia), treatment duration, antimicrobial resistance, newer antibiotic combinations, rescue treatments, geographical distribution of the eradication results merit further analysis and updated research. The correction of the English manuscript by Mr.Douglas Arnott (EDMF Translation Bureau, Budapest, Hungary) is highly acknowledged.